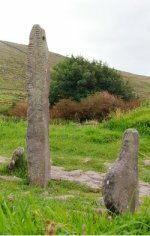 I went to the Dingle Peninsula in Ireland in 2009 and found the Ogham stones. Ancient monuments to people long gone, with inscriptions in the Ogham alphabet carved into the stone, they were scattered through churchyards and wild places. I made a series of charcoal drawings to try to capture the weather and wild landscape and, also, the dedication of the people who created and erected the stones.